SEOUL, Oct. 23 (Yonhap) — Tottenham Hotspur’s South Korean forward Son Heung-min has scored his first league goal of the season in his club’s 4-1 win over Liverpool. 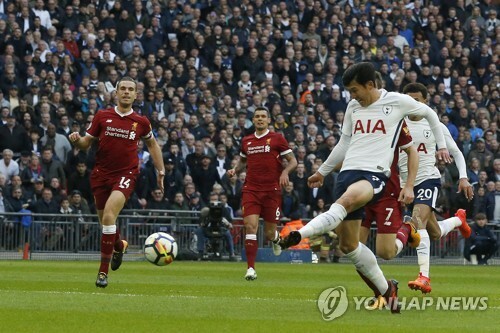 Son scored Tottenham’s second goal against Liverpool at Wembley Stadium in London on Sunday (local time). With Spurs leading 1-0, Son found the net with his left foot as he redirected a cross from Harry Kane in the 12th minute. This was Son’s first Premier League goal in the 2017-18 season. The 25-year-old South Korean scored in Spurs’ 3-1 win over Borussia Dortmund in the UEFA Champions League clash last month, but he had been silent in his first seven English Premier League (EPL) matches. It was also Son’s 19th Premier League goal since he joined the London club in 2015. With his latest scoring, Son is now tied with former Manchester United midfielder Park Ji-sung for most Premier League goals by an Asian player. Against Liverpool, Son started as a forward next to Kane, who netted a double to help extend the Spur’s EPL winning streak to four matches. Son, a former Bayer Leverkusen man, could have scored his second goal in the 16th when he received a pass from Christian Eriksen in the box, but his right-footed shot rang off the crossbar. Son received a standing ovation when he was replaced by Moussa Sissoko in the 69th. With an EPL record attendance of 80,827 at Wembley, Son said he was happy to score a goal against a club like Liverpool. Spurs are now third in the EPL table with six wins, two draws and one loss. They will next face West Ham United in the League Cup match at home Wednesday. Son netted 21 goals in all competitions during the 2016-2017 season, breaking the single-season scoring record for a South Korean in Europe, previously held by Cha Bum-kun, who had 19 goals for the German outfit Leverkusen in the 1985-1986 season. Son was also named the Premier League’s Player of the Month twice.